CAIRO - Al-Jazeera English reporter Peter Greste left Egypt on Sunday after the president approved his deportation, but there's no official word on jailed colleagues Egyptian-Canadian Mohamed Fahmy and Egyptian Baher Mohamed. Greste was released after more than a year behind bars in a case that was widely condemned by rights groups. A Cairo airport official said Greste, an Australian national, is on an EgyptAir flight to Larnaca, Cyprus that took off shortly after 4 p.m. (1400 GMT) on Sunday. An Egyptian prison official and the nation's official news agency said Greste was released following a presidential "approval." The official and an Interior Ministry statement said his release was an implementation of the new deportation law passed last year. The officials spoke on condition of anonymity because they were not authorized to speak to the media. A lawyer for Fahmy said his client welcomed the news. "He has instructed me to say he is very happy that Peter has been released and hopes for the same outcome for himself soon," Lorne Waldman said in an email to The Canadian Press. Foreign Affairs Minister John Baird spoke Sunday with his Egyptian counterpart, Sameh Shoukry, about Fahmy's case, the ministry said in a statement. Baird said he welcomed Greste's release, and noted that he remained hopeful that Fahmy's case will be resolved in short order. "Canadian officials will continue to work closely with the Egyptian government to provide consular assistance to Mr. Fahmy to ensure his well-being," the statement said. Greste, Fahmy and Mohamed were sentenced to at least seven years in prison on terrorism-related charges last year in a trial described as a sham by rights groups. Reuters quotes an unidentified security official as saying Fahmy is expected to be released from Cairo's Tora prison within days, and his fiancee as saying she is hopeful he would be released soon and deported to Canada. "His deportation is in its final stages. We are hopeful," Marwa Omara said. The release of Greste, 49, who also holds Latvian nationality, was welcomed by Al-Jazeera and Amnesty International, but both said the fate of the other journalists must not be forgotten. Acting Al-Jazeera Director General Mostefa Souag says the Qatar-based network "will not rest until Baher and Mohamed also regain their freedom." Hassiba Hadj Sahraoui, Amnesty International's Deputy Director for the Middle East and North Africa, added that "nothing can make up for his ordeal." "It is vital that in the celebratory fanfare surrounding his deportation the world does not forget the continuing ordeal of Baher Mohamed and Mohamed Fahmy, who remain behind bars at Tora prison in Cairo." 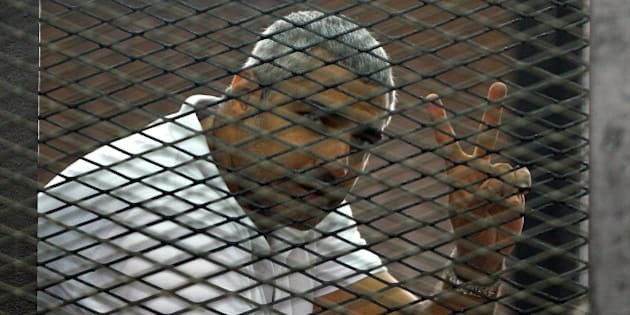 Greste's release came the day an open letter from Fahmy's family to the Egyptian president was published online, pleading for his release. "He is an innocent man and needs urgent medical treatment for his Hepatitis C and permanent disability in his shoulder," said the letter from his mother, Wafa Abdel Hamid Bassiouni. "It hurts me to see his health deteriorating while I have little access to him. "Mr President, as a journalist my son never strived to tarnish Egypt's image. It’s this Al-Jazeera case that now smears Egypt's reputation abroad." The three were arrested over their coverage of the violent crackdown on Islamist protests following the military overthrow of President Mohammed Morsi in 2013. Egyptian authorities accused them of providing a platform for Morsi's Muslim Brotherhood, now declared a terrorist organization. The three were also convicted for spreading false information, faking reports to show that the country was on the verge of civil war, and for aiding the Brotherhood's goal of portraying Egypt as a failed state. Mohammed received an additional three years for his possession of a spent bullet. Three other foreign reporters received a 10-year sentence in absentia. Twelve other co-defendants were sentenced to between seven and ten years, some of them in absentia. Rights groups and several media outlets condemned the verdicts as political, saying the three were doing their job during a tumultuous time. According to a law passed late last year, Egyptian President Abdel-Fattah el-Sissi has the power to deport foreign defendants or convicts if it's considered to be in the interest of national security. The law was seen as providing a potential legal instrument with which to free the journalists. Greste had only been in Egypt for weeks, working on a short relief for his colleagues, when he was detained.